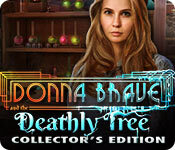 Donna Brave: And the Deathly Tree Collector's Edition is rated 3.0 out of 5 by 27. Rated 5 out of 5 by lvd333 from I Have a Present for you~ I'm totally enjoying the Donna Brave Series! The Graphics are off the charts, I'm a sucker for good Art, quite stunning!! The Story intriguing. Your friend received a plant as a Gift, or was it revenge? As this plant has matured into a living tree with poison deadly enough to take lives, and now your friend, Kathi, is in danger and seeks your help. This Sweet poor little rich girl's friends aren't very fond of her, and could care less that she is in dire need for her life, but wouldn't mind her possessions...so if you want your investigation to run smooth, you have to do them favors....but you don't have time to put them in their place, but save Kathi and her family, so you cater their whims in order to get clues...If you have enemies they have to try and bring you down some way, instead of drinking or eating tainted food, the evil-doers find new and clever ways to destroy people without being found out...WHY NOT the Poisonous 'TREE' way, huh? ...but that's what makes the story kinda fun, almost like in the real world, you have haters. So, as for this HOG, it's very interactive.... the whole point of finding things and putting them together and saving the World. This is a total buy for me. Rated 5 out of 5 by Majestyx12 from The Roots are Practically Indestrutible Based on the completed game and bonus material. 5 Chapters + Bonus chapter. A beautiful game with 19 hops. 15 in the main game and 4 in the bonus. I liked over half of the puzzles. The morphs are very slow. I think too slow if I have to wait and wait to find it. It takes up too much time. But I rather wait then not have morphs. The morphs are generous and they have a good indicator. 47 in all. 19 of them are in the hops and the rest are in the scenes. Yes, morphs in every scene and in the hops. After the game, you can go back and get the morphs and collectibles. 28 collectible magnifying glasses which also has a good indicator. I liked the maze the best and I didn't like the fight scene. The barking dog in chapter 5 was irritating. I had one puzzle that couldn't be completed. You can replay all 19 hops in the Hops Gallery and if you missed a morph there, this is were you pick it up. There is only one replay puzzle and you have to earn it. It's the card game. you must find all of the morphing objects to unlock this feature. I don't know what I did for the Ultimate Hops to appear in the bonus content maybe it's tied to the morphs also. But I have the Ultimate Hops and I can replay that also. It's a generous hops game that you choose items from the list and it puts more items on the list. Like it's refilling. Achievements, Hops Gallery to replay 19 hops, 10 music track that you can download, 12 wallpapers, 12 concept art. If you find all the morphs you have the card game and the Ultimate hops? Rated 5 out of 5 by Tundei from No red eyed demons! Finally a game with no red eyed demons or missing relatives to look for. Great story line, nice graphics, love it. A buy for sure. Rated 5 out of 5 by miansc from A Donna Brave Sequel I beta tested this game some time ago and have been waiting to see its arrival. I hadn't played the first Donna Brave game at that time. So this was quite a treat to me! I know others have gone into depth about the mechanics and storyline. I can only add that I really enjoyed this game. There is something different and charming about the Donna Brave games and I welcome that .. So many games feel like " I have played this before". After playing this game, I immediately bought the first game. I have not been disappointed but greatly pleased. Please try the demo and see if this is a game for you. If you played the first one, I cannot see how you would not welcome this refreshing game. Enjoy and have fun! Rated 5 out of 5 by rainworm from A green thumb can sometimes be dangerous This is the second installment of Donna Brave. In the first game we could greet Donna as a new hobby detective, whose mission to help her uncle was mastered quite professionally. In the Deathly Tree, Donna hurries to help her old schoolmate Kathi Wagner, who sent a letter, urging her to come immediately. When Donna arrives at the manor, surrounded by a beautiful park, she is not a minute too late, as the friend is being attacked by the roots of a tree. Before this happened, Kathi could shortly summarize: One evening a sapling was left on the threshold of the manor. She planted it in the garden and it grew into a tree fast. By now it has mutated into a sort of killer plant and there are its leaves: finding one, you know, you are marked for death. Even after releasing her, Kathi is deadly ill now and we, playing as Donna, need to investigate who is behind the corrupted tree and tries to kill the Wagners and their friends. In the villa are Kathi’s father Leon, her fiance Stefan and in the dining room an employee and cousin Trudi. Whereas Leon and Stefan care for Kathi, the other two seem distant and lack empathy. Suspicious? Leon is afraid, he could be to blame, as he did something years ago, which he regrets now and he wants to tell us all about it, but before he can get to the point, he gets caught by the roots, which draw him out of the window. We are on our own and can only gather clues and link hints from the past to the current events in order to find the culprit. Again we have tools in this game: the medaillon, known from the first adventure, and a special box, which reveals parts of the background story in riddles. Both help understanding the current events in the game and come in quite entertaining. The medaillon uncovers the history of an object, when put into it. We learn about Kathi’s 12th birthday – and the consequences….. A masterly told crime story. Rated 4 out of 5 by dlylight from challengeing ho's This game really held my interest and the ho's were very challenging, more so than many of the recent games I've played. Actually took longer to solve and very clever. Enjoyable game for middle of winter doldrums! Rated 4 out of 5 by condorcandi from This was a great game I was one of the beta testers of the game, and it was highly entertaining just in that format. Plus, either coincidence was stretched to the max, or the tree has a nasty streak in whatever it has for a mind. I highly recommend playing this game! Rated 4 out of 5 by spikescajunmom from Not Everyone Likes Killing Weeds, But I Do Donna goes to visit her friend for her birthday and she finds her panicked because she believes she's going to die. Oh, and there is a killer plant/tree/root. I won't rehash the story line or details because others before me have done a great job of it. A lot of people rated this game low, which I get and they have every right to do because they might hate it and it's their opinion. I LOVED the first Donna Brave game in Paris. It was an excellent game and I have enjoyed replaying it. To be honest, this game is not as good as that one and I really wish it was. If you haven't tried the first one, you should. With that being said though, I Beta tested this game (I play Expert level with no help) and I enjoyed it. If you enjoy finding collectibles, morphs and doing HO's with a number of difficulty levels to choose from, you might like this game. It might also be a nice choice for those who don't like running from a demon in a hellscape that's trying to kill you like I do. I haven't played the whole game so if that's in there, sorry. I didn't have some of the issues that others have had like with graphics, story line, "being unbelievable". I mean not everyone likes the same graphics and every story line has been done. I haven't seen anything "new" in a long time. As far as being "believable", "killer" plants have been done before and not more ridiculous than talking helper animals, being sucked into another dimension, ghosts/spirits killing people or Santa's evil brother, so to each his own. I've played 100's of games over 10+ years on BFG and not all games are winners, most are not. Play the demo and if you like it buy it. If you don't, then don't. Use others reviews as a guide, but use your own game play experience to decide if you like it or not. That goes for all games, not just this one. 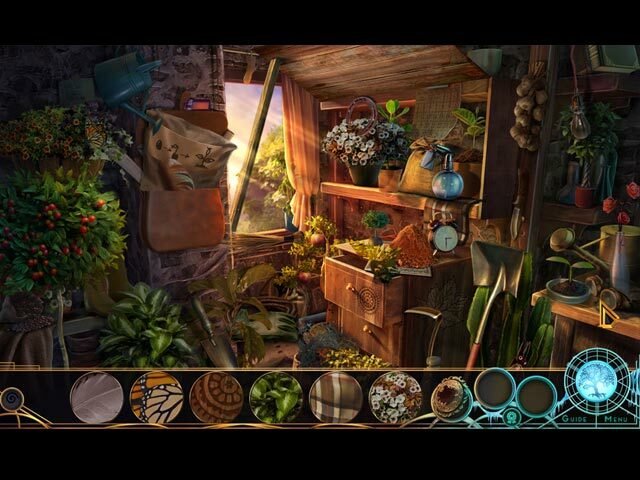 Rated 4 out of 5 by nadaze2da from How does your garden grow? With potions and gene splicing! This second installment of the new Donna Brave series by Mad Head is not as bad as some reviewers lead you to believe. It is not a five star game but I think it comfortably fits into the 4 star category. There is a gimmick which is a box in which you can put an item and then see the story about it. This is not overused as gimmicks are in some games. It is unfortunate however that there is no mystery to "who done it" because I think that may be evident almost from the beginning. The story is a bit bizarre because the villain has perfected genetically modifying plants. Hence the killer tree which snatches up its victims and is supposedly indestructible. The tree roots also cover things in ice. The devices you use to melt the ice do not necessarily include matches. Thank goodness I don't remember coming upon a single tool that needed to be sharpened nor a missing zipper pull. I may be a dullard, but I found some of the mini games rather confusing. Others were easy enough to sail through. 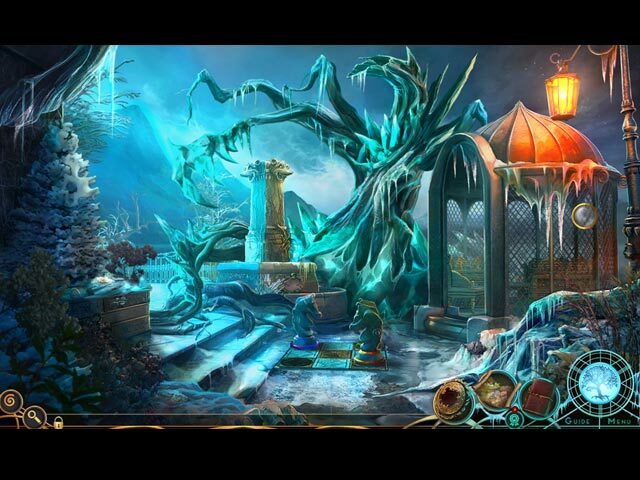 A hidden object game is about looking for hidden objects, right? And not just in the HOs themselves. Find a key, find a bucket, find an amulet, etc. Otherwise, why do we play them? 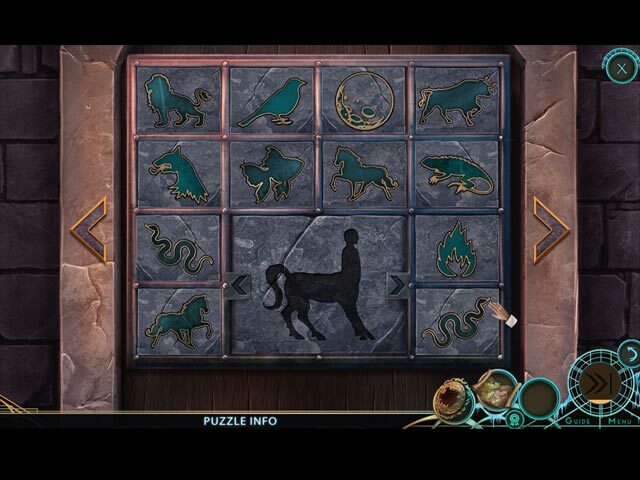 This game is not so saturated with amulets and locks and keys as some games are. There is a bit of back and forth but its usually within two or three scenes in the game and the map is a jump map. I believe this game deserves an "E" for "effort" because the developer attempted to do something a little different. To some, the effort may have fallen flat but I kinda liked this game. I would have preferred that the mouths of the characters moved when they spoke but that is just aesthetics. Graphics were nice. Voice acting was perhaps a bit lacking but overall pretty good. You can customize the difficulty of the game and I usually do when its offered. Take it for a spin, see what you think.